Is the Nasdaq driven higher by a few high-flying stocks, or is the rally supported by a broad base of solid performers? The composition of a rally makes a difference, but some narrow-minded analysts ignore some of the facts. I’ve read a couple of articles recently commenting on the stock market’s ‘bad breadth.’ In particular referring to the S&P 500 (NYSEArca: SPY) and Nasdaq. One stock market forecasting service claimed on Friday that only 5.27% of Nasdaq Composite (Nasdaq: ^IXIC) stocks trade at 52-week highs and that the Nasdaq is poised to roll over. 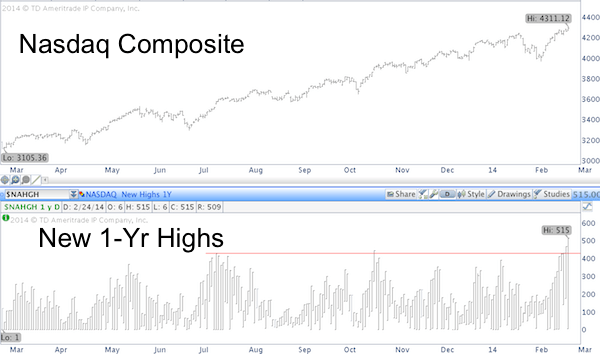 Contrary to this claim, the chart below – which plots the Nasdaq Composite against the number of individual Nasdaq Composite component highs – shows that the number of stocks at new 52-week highs is at a one-year high. The Nasdaq (Nasdaq: QQQ) has tagged on another 5% since than, and you may not be surprised to hear that the above observations come from ‘perma-bear’ forecasting services. Nevertheless, it is true that the percentage of Nasdaq and S&P 500 (even NYSE) constituents above their 20, 50 or 200-day SMA’s is lagging. But such kinds of breadth divergences are a blunt timing tool. In fact, the percentage of S&P 500 and Nasdaq stocks above their 50-day SMA peaked in January 2013 (at 93.4% for the S&P 500 and 80.29% for the Nasdaq). “Dead man walking” is an expression used by prison guards as the condemned were led to their execution. Are we looking at a ‘dead bull walking?’ The post-2009 QE bull market is nearly five years old. The average bull market lasts about 3 ½ years. In terms of longevity, this bull market is on borrowed time. What about other factors? Stages 2 and 3 are available to subscribers of the Profit Radar Report. No doubt the bull market is aging, but ordering the coffin right now appears premature. This doesn’t mean that stocks won’t pull back. An upcoming pullback is quite likely. More importantly, the interpretation of the above data shows that objectivity is a key ingredient to a market forecaster’s success. Investing with blinders and looking for data that supports any particular bias tends to end in tears. 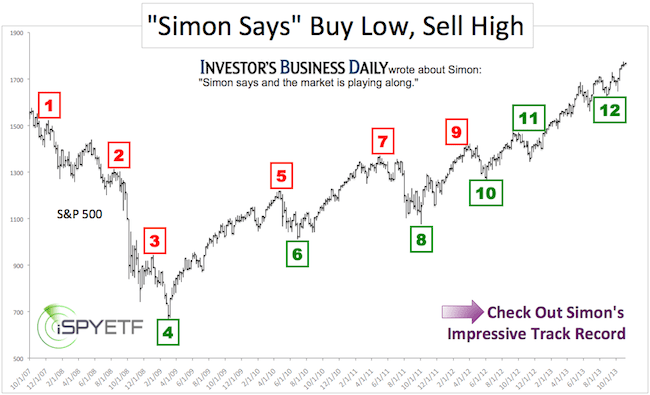 On February 14 we highlighted a ‘big fat’ buy signal. Now we are looking at a possible ‘Black Swan’ alert. This indicator was designed to sniff out big drops and although we may not be looking at a ‘Black Swan’ sell off, it suggests risk is rising. On February 14, I wrote about a ‘big fat’ buy signal (New Spin on Old Indicator Gives Big Fat Buy Signal). Now this ‘big fat’ buy signal is met by an indicator that suggests elevated risk of a serious decline (‘Black Swan’ event). Which indicator measures the odds of a ‘Black Swan’ event? It’s the CBOE SKEW Index. The SKEW Index is calculated by the CBOE. The CBOE is also responsible for the VIX (NYSEArca: VXX). According to CBOE, the SKEW is designed to measure the tail risk (= risk of outlier returns two or more standard deviations below the mean) of the S&P 500. Similar to the CBOE VIX or VIX Volatility Index (Chicago Options: ^VIX), the price of the S&P 500 tail risk is calculated from the price of the S&P 500 out-of-the-money options. 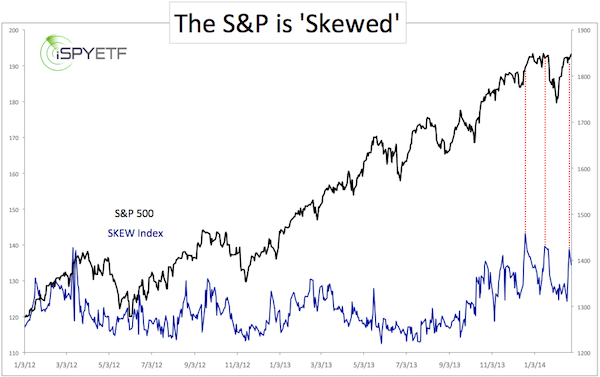 The chart below shows the SKEW readings since January 2012 and plots them against the S&P 500 (SNP: ^GSPC). On Friday the SKEW jumped to 138.79. This isn’t the top tick (December/January saw 139.62 and 143.20), but it’s higher than 99.5% of all other readings since January 2012. The red lines highlight that elevated SKEW readings (such as 138+) translate into limited up side potential and increased down side risk. The SKEW is very helpful, but should be combined with other facets and forward-looking analysis. The S&P 500 and S&P 500 ETF (NYSEArca: SPY) saw a ‘deeper but temporary’ correction and price and SKEW are basically back to where they were in January. More up side is possible as long as the S&P 500 can stay above support, but the SKEW suggests that the up side is limited and any gains to be erased eventually. Back in December you couldn’t get investors to touch gold even with a 10-foot pole. From low to high, gold has rallied 13% since and analysts are starting to up their full-year targets. This could be a costly mistake. About 50 days ago analysts gave gold a snowball’s chance in hades to move higher. The December 2013 headlines below show that investors were as bearish about gold as they were bullish about the S&P 500 (NYSEArca: SPY). Up until February 11, gold’s rally attempts were feeble, with gains of less than 4% since the December 31 closing low at 1,204. Silver confirmed gold’s move on February 14 (when it surpassed its prior highat 20.64), which helped gold jump above its 200-day SMA. 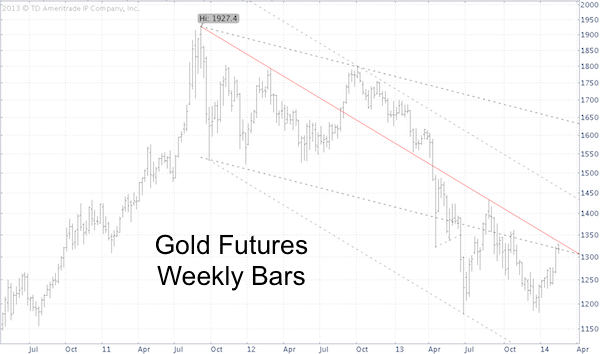 However, as the weekly long-term gold chart shows, there’s significant trend line resistance right around 1,335, which has kept a lid on gold’s rally. 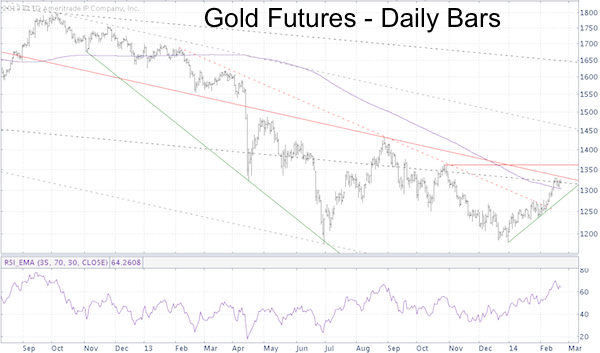 The short-term daily gold chart illustrates additional short-term support/resistance levels. It also shows that RSI confirmed the recent rally high, which suggests new highs in the future. However, any new highs could be short-lived. A thorough analysis of gold money flows – in particular Gold ETFs like the SPDR Gold Shares (NYSEArca: GLD) and iShares Gold Trust (NYSEArca: IAU) – strongly suggests that new lows for gold and silver are still ahead. Since mid-January, the S&P 500 has lost and gained 110 points. On the chart, the S&P’s journey looks like a near perfect V-pattern. There’ve been many such V-patterns in recent years. Here’s how the S&P has performed going forward. 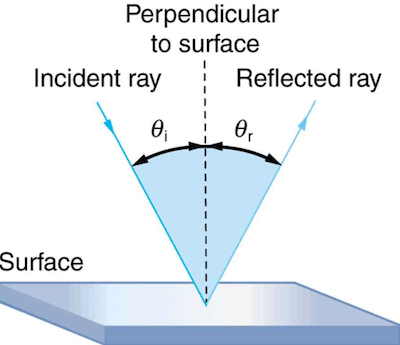 According to the law of reflection, the angle of incidence is equal to the angle of reflection. Apparently the law of reflection also applies to stocks. The S&P 500 chart below shows a near-perfect V-shaped pattern. Is this V-pattern bullish or bearish for the S&P 500? If you are looking for V-patterns or V-formations in your technical analysis handbook, you probably won’t find anything. Unlike a head-and shoulders or triangle pattern, there are no odds, measured targets, or trigger levels for V-formations. But there are past precedents. 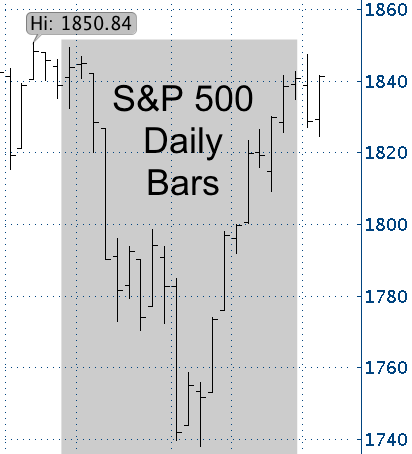 The S&P 500 chart below highlights prior V-pattern sightings. Over the last three and a half years there’ve been about 14 V-formations, with an average top to bottom range of about 90 points. Since we’ve enjoyed a wonderfully manipulated bull-market, most V-patterns obviously turned out to be longer-term bullish. However, as highlighted by the red boxes, the completion of the V’s right rim has often been met with at least temporary selling. As in the past, the upper edge of the V is acting as resistance for the S&P 500 (NYSEArca: SPY). A projection of what’s next was published in the most recent Profit Radar Report. There’s another indicator that hasn’t (yet?) confirmed stocks’ up trend. Compared to prior snap back rallies, MACD is moving quite slow this time around. It will take another push higher to convince MACD of this rally’s staying power. There are leading indicators and there are lagging indicators. Leading indicators (are supposed to) predict turns before they occur. Lagging indicators confirm a turn after it occurred. The S&P 500 (SNP: ^GSPC) has overshot 1,830; the ideal up side target outlined by the February 9 Profit Radar Report. Despite the strong rally, one lagging indicator has not yet confirmed the S&P’s up trend. MACD. 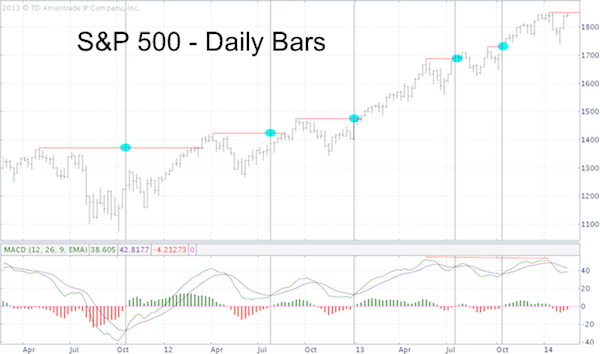 The chart below plots the S&P 500 against weekly MACD. The green line is still well below the purple line as the histogram shows. MACD is a momentum indicator so a delayed reaction is normal, however prior up trends were confirmed quicker than the current one. The vertical black lines mark bullish MACD crossovers. 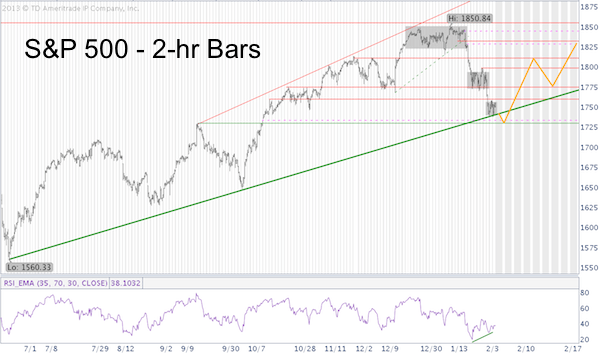 The horizontal red lines mark the high prior to the correction. The blue dots illustrate that the MACD generally turned positive before the S&P 500 (NYSEArca: SPY) surpassed its prior highs. This isn’t the case this time around. Although the S&P 500 has come within four points of its prior high, MACD continues to lag. It’s always difficult to extrapolate meaningful forward looking guidance from a backward looking indicator, but MACD suggests the rally may not (yet?) be as strong as it needs to be to break out. In addition, we note that MACD at the S&P’s January high stayed below the MACD reading at the May S&P high. This is another potentially bearish divergence. If you’ve read my recent articles, you notice that there are enough bearish indicators to paint a bearish picture and enough bullish indicators to paint a bullish one. Am I playing both sides of the market? No. But it is important to be aware of all the facts and make an educated decision. Sometimes the most obvious path is the right path. So far, the S&P 500 has followed the Profit Radar Reports proposed outlook (rally from the 1,730s to the 1,830s) so it deserves the benefit of doubt until proven wrong. Simon Maierhofer is the publisher of the Profit Radar Report. The Profit Radar Report presents complex market analysis (S&P 500 technical analysis, Dow Jones, gold, silver, euro and bonds) in an easy format. Technical analysis, sentiment indicators, seasonal patterns and common sense are all wrapped up into two or more easy-to-read weekly updates. All Profit Radar Report recommendations resulted in a 59.51% net gain in 2013. Investing is about value, buying low and selling high. But how do you determine value if the most popular value gauge has been compromised. Yes, via a 2008 economic stabilization act, Congress changed the ‘E’ of P/E. In 2008 everyone (aside from short-sellers) were in crisis mode. Banks, Federal Reserve, Treasury Secretary and the President were ready to do whatever it takes to get the job done. The job? Bail out banks and push the S&P 500 higher (SNP: ^GSPC). How? Didn’t matter. The job got done, and with stocks as with sausages, if the end result tastes good you don’t ask how they’re made. Not a day goes by where we don’t read about bank profits, bank bonuses, and bank shenanigans to make more profit. So let’s talk about bank profits for a moment. Not everything that shines is gold and not everything that’s black on the income statement is profit. There was a time when banks loved the Mark-to-Market accounting model, because it allowed them to showcase truly miraculous real time profits. 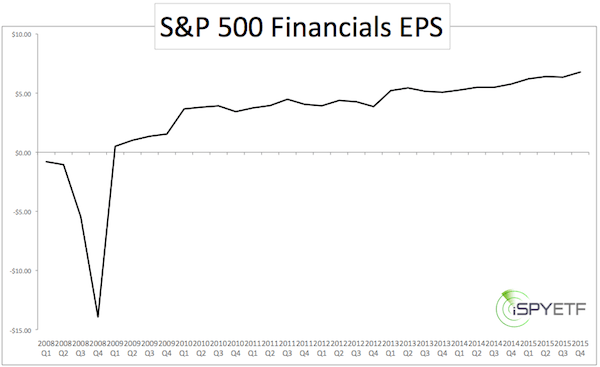 By 2006/07 the financial sector accounted for over 40% of S&P 500 earnings. Things changed in 2007/08. Mark-to market wasn’t so popular with banks because it revealed enormous real time losses. Bankers don’t like to see red. Bankers prefer to hide their losses. The Federal Reserve and Congress decided that’s a good idea since losses erode confidence. Bankers lobbied the Financial Accounting Standards Board (FASB) to change the fair market accounting rule – rule 157 – but the FASB resisted. The FASB knew that changing fair market or Mark-to-Market was a free pass that practically required no write-downs ever. However, via the Emergency Economy Stabilization Act of 2008, Congress gave the SEC the authority to suspend Mark-to Market accounting. FASB was strong-armed and FASB rule 157 was suspended on April 2, 2009. FASB 157 – What Does it Mean? Since April 2, 2009, banks are basically free to value their toxic assets as they please. This example illustrates how the financial engineering formula works in real life. 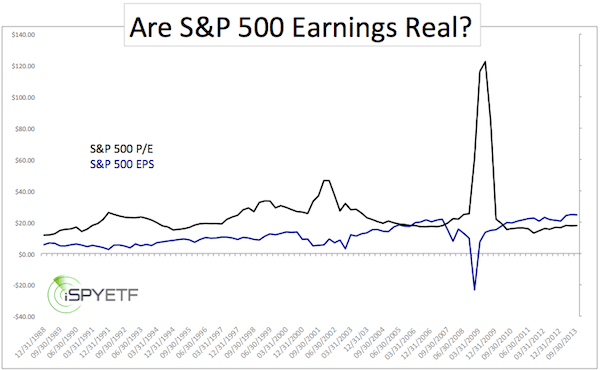 The two charts below show 1) S&P 500 P/E ratio and EPS (based on as reported data) 2) S&P 500 financial sector EPS (datasource: Standard & Poor’s). Bank ABC holds mortgage-backed assets originally valued at $1,000. After running some proprietary and non-verifiable models the bank determines it will eventually sell the asset for $950. The loss, termed credit loss, is only $50. However, because of MBS bad rep, the banks portfolio is currently worth only $500. The actual current value ($500) minus the credit loss ($50) is called noncredit loss ($450). The $450 noncredit loss is recorded on the balance sheet under “comprehensive income,” but is not run through the income statement. Those losses don’t affect earnings, and are excluded from banks’ regulatory capital calculation. That’s right, every single bank earnings report since April 2, 2009 did not account for losses from toxic assets. This means that the P/E ratio for ETFs like the Financial Select Sector SPDR (NYSEArca: XLF) and by extension the SPDR S&P 500 ETF (NYSEArca: SPY) is skewed. It’s been nearly four years since the FASB rule 157 change, so why write about it now? This is a shocking and disturbing piece of news. Reuters got a hold of a ‘secret document’ that shows the European Commission proposing wholesale confiscation of private European assets, for the greater good of the EU. A document discovered by Reuters (available here) revealed two shocking developments in Europe. Keep in mind that politicians are crafty when it comes to using appealing and concealing verbiage, so let’s try to translate a couple of specific terms. What does “Savings of EU citizens could be used to fund …” and “mobilize more personal savings” really mean? Obviously, EU citizens don’t feel comfortable willingly investing in the kind of shenanigans the EU Commission (and probably EZB) is about to propose. “Mobilize more personal pension savings” is more attractive than confiscate, but essentially means the same thing. How much money are we talking about? 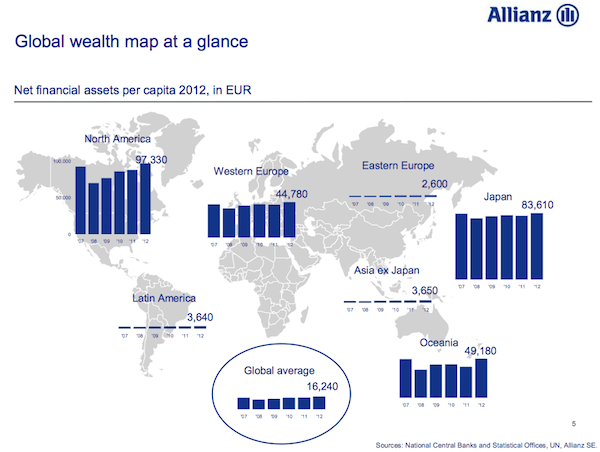 A quick thumbnail calculation based on the data of Germany’s insurance giant Allianz (which pegs the per capita wealth of Western Europe at 44,780 euro) suggests total private assets amount to roughly 17 trillion euros (or $23.3 trillion). 2) Additionally, the EU Commission apparently would like to do away with fair value pricing in connection with long-term securitization of mortgages and trading of corporate bonds. Let’s review and allow a moment for this to sink in: The EU economy is weak. The money of its citizen is to be used (seemingly against their will) to create the kind of financial products that caused the post-2007 financial crisis. Accounting standards are to be changed to inflate prices and hide potential losses. The asset confiscation part is unusual even by U.S. standards, but the proposed accounting trick was born in the U.S. before it appeared in this European proposal. Near bankrupt banks all of a sudden turned profitable (on paper) and the S&P 500 and Dow Jones soared. In fact, this simple accounting trick may have contributed more to the post-2009 S&P 500 (NYSEArca: SPY) and Dow Jones (NYSEArca: DIA) rally than QE.